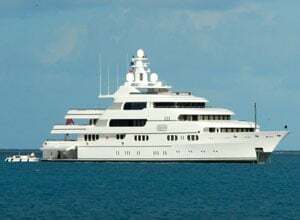 The unreserved megayacht auction attracted an intimate crowd of bidders who gathered on-site at the Ritz-Carlton Hotel in Grand Cayman, Cayman Islands and participated online for the opportunity to purchase the 220-ft (67 m) luxury Lurssen megayacht. The auction was fast-paced, with the crowd starting the bids at (euro) 20 million. Less than 15 minutes later, the megayacht was sold to a buyer from the United Kingdom. "I'm really pleased with the outcome," said Mr. Ritchie. "I never worry about an unreserved auction. It works. At the end of the day, I received fair market value for the Apoise. It didn't take me two years to sell the Apoise, and I didn't incur the significant carrying costs over that time. I was given an auction date and it was sold on that day for fair market value. I know the new owner of Apoise will enjoy cruising the world as much as I have." Dave Ritchie purchased Apoise when he retired from Ritchie Bros. in 2006. He spent the last four years cruising around the world. His intention was always to sell the megayacht at a Ritchie Bros. unreserved auction after completing his travels. Dave Ritchie, along with his brothers Ken and John, founded Ritchie Bros. Auctioneers in 1958 on two core principles: conducting strictly unreserved auctions and treating every customer with fairness and respect. He was pivotal in leading the Company to its current position as the world's largest auctioneer of heavy equipment, with billions of dollars in annual gross auction proceeds and operations worldwide, including 40 auction sites.